Joshua E. Roston, 33, turned himself in Thursday night in Philadelphia, officials said. The Baldwin man is accused in the fatal hit-and-run of a gas station manager in South Hempstead on Monday. A Baldwin man turned himself in to Philadelphia police Thursday night after he was accused of killing a gas station manager in a hit-and-run in South Hempstead on Monday. 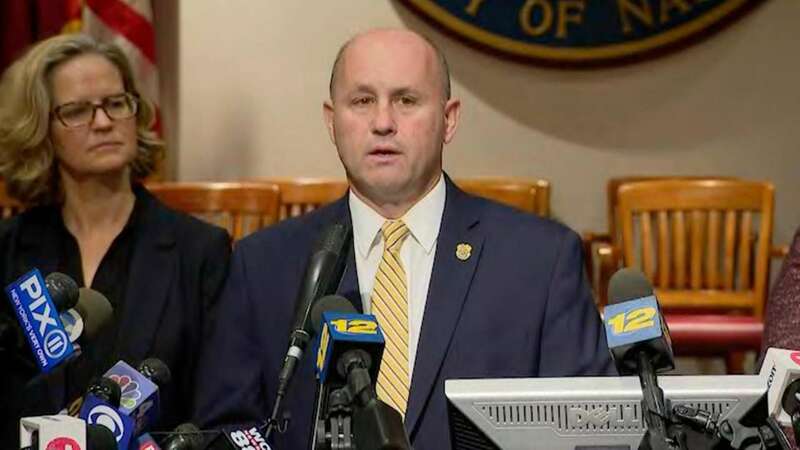 Joshua E. Roston, 33, faces a charge of intentional murder, which has a potential sentence of 25 years to life in prison, said Nassau County District Attorney Madeline Singas at a news conference Friday afternoon. Authorities are working to extradite Roston from Philadelphia following a flood of tips after police identified him to the media. Roston allegedly ran over and killed Cemal Dagdeviren, 59, of Levittown while trying to flee from a Pit Stop gas station in South Hempstead on Monday morning without paying for about $22 worth of gas, police have said. Dagdeviren’s funeral was held Wednesday, following a vigil Tuesday night at the gas station. Family, friends, co-workers and customers described the Turkish immigrant, who moved to the United States 25 years ago for opportunities for his family, as a hardworking and friendly man. His family could not be reached for comment on Friday. A GoFundMe page seeking to help the Dagdeviren family with funeral expenses had raised $22,610 by Friday afternoon. Authorities harnessed the power of social media and sought the public's help in the case, making it the second time in recent weeks that tips led to a high-profile arrest. The first case involved a Bronx man, accused of scamming seniors, who was arrested last month. Shortly before 7:30 a.m. Monday, Roston pulled up to the full-service Pit Stop and asked for a full tank, police said.. The attendant pumped $22 worth of gas into the vehicle but was concerned about Roston's behavior and noticed the SUV was missing license plates and stickers for inspection and registration. Roston appeared to flash a $50 bill during the encounter, police said. The attendant asked Roston to pay inside the service station, where Roston allegedly tried to use a fake credit card. The clerk would not complete the transaction and Roston said he didn’t have enough cash to pay, despite appearing to have a $50 bill. Roston got into his SUV and allegedly accelerated as Dagdeviren put his hands on the hood and tried to stop it. Roston ran over Dagdeviren, who was pronounced dead at South Nassau Communities Hospital, police said. Authorities released surveillance footage of the hit-and-run on Monday, asking for help to identify Roston. “We got a ton of tips,” Ryder said on Friday, noting that the help led authorities to identify the suspect and find Roston’s SUV, abandoned, in Pennsylvania. On Thursday, authorities held a news conference announcing the vehicle’s recovery and released a photo of Roston and again pleaded for assistance. More than two dozen tips came in, Ryder said, calling the help “crucial.” Nassau police worked with Pennsylvania State Police and Philadelphia police and were in the area when Roston surrendered Thursday night. Roston was arrested Jan. 11 and charged with petit larceny for attempting to steal a pair of boots from a Sears in the Green Acres Mall in Valley Stream, police said. Hempstead police also arrested Roston on Jan. 5 and charged him with unauthorized use of a vehicle, Ryder said. Roston was arrested in April 2018 for stealing $30 worth of gas from a gas station in Roosevelt, Ryder said.